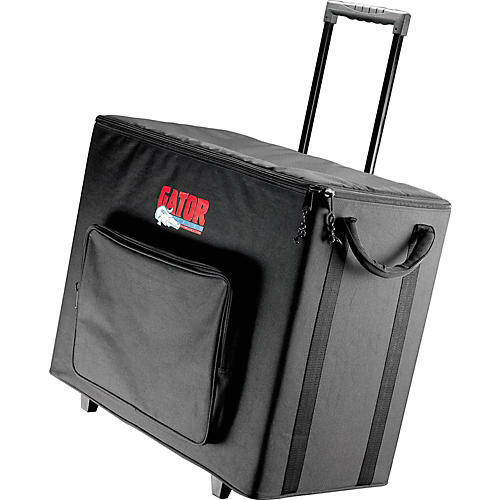 The hard top of the Gator G-112A rolling amp stand supports the amplifier on stage and support rails keep it from vibrating off during the performance. Rugged 600-denier nylon cover a wood frame. The interior is padded with 20mm of high-density foam covered in Tricot for ultimate protection. Equipped with rugged, reinforced webbing side handles for carrying over rough terrain plus a large accessory pocket for pedals, cables, and gear, the amp stand and transporter is equipped with heavy-duty wheels and an improved pull-out handle with a crush guard. 25"L x 12"W x 19"D.